Hollywood loves to use hyperbole. “Brilliant,” “greatest” and “of all time” are bandied about as often as Keanu says, “Dude.” It’s all part of the mass marketing mentality that dominates the industry. When the Walt Disney company calls a brand new film a “classic,” you have to wonder if their copywriters own a dictionary. And it seems as if every director who does something slightly outside of the mainstream (while still working in the studio system) is instantly dubbed a “visionary,” regardless of how derivative their style or wanting their abilities. But copping a style from Edward Gorey , the Cure and the circus doesn’t make you a visionary, Tim Burton. And even the most visually exciting film falls flat if all the other storytelling elements don’t, oh, shall we say, reload the Matrix. So when a filmmaker comes along who does seem to be able to blend all the collaborative aspects of the medium of film into a mosaic that is not only distinctive, but rewarding, it’s a cause for celebration. So let’s all jump for joy at the release of “the Life Aquatic With Steve Zissou ,” the fourth film from our favorite contemporary visionary, Wes Anderson. 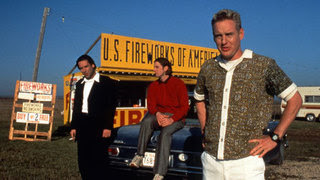 Anderson’s first feature, 1996’s “Bottle Rocket ” is his most straightforward film. This tale of a trio of inept would-be criminals has little of the visual idiosyncrasies that would mark Anderson’s later movies, but the theme of misfits following their hearts (regardless of the odds) are very much in place. Still, unlike his trademark later pictures, “Bottle Rocket” takes place in the real world, where bullies reign and the dreamers struggle, often in vain. “Bottle Rocket” was the teaser for the slightly skewed worlds that Anderson would next create. 1998’s “Rushmore ” tells the tale of overreaching underachiever Max Fischer (Jason Schwartzman). Max is the worst student at Rushmore Academy, partly because all of his time is taken with every conceivable extracurricular activity: French Club, Stamp & Coin Club, Debate Team, Calligraphy Club, Choir, Bombardment Society, the Rushmore Bee Keepers and more. But Max’s true loves are the Max Fischer Players, a theatrical troupe that puts on elaborate stage versions of things like the 70’s cop film, “Serpico ” and Miss Cross (Olivia Williams), the beautiful but lonely first grade teacher. Max befriends a wealthy steel magnate (Bill Murray in his real breakout role) who likewise develops feelings for Miss Cross and a bizarre quasi-romantic triangle builds. The New England setting and tone of “Rushmore” feels like it’s not quite the real world anymore, rather slightly skewed towards Max’s perspective. It’s a world where a school allows Max to present “Heaven and Hell,” a Vietnamese War play with tons of gunfire and real explosions. Adults bend to the whims of children for no apparent reason other than the force of their convictions. The oddballs have a slightly easier time of it. It feels much like the surreal suburbia of “the Adventures of Pete and Pete ” or Stars Hollow in “Gilmore Girls ” (trivia note: Alexis Bledel of that show is an extra in “Rushmore.” She sits next to Max at Grover Cleveland High). It’s probably no coincidence that Anderson used Vince Guaraldi’s “Peanuts” music in two of his movies. Max Fischer could be Charlie Brown as a teenager. Anderson’s third film, 2001’s “The Royal Tenenbaums ” deals with family dysfunction and unrealized promise. The estranged patriarch of a family of former child geniuses, Royal Tenenbaum (Gene Hackman) makes a last ditch effort to reconnect with his family, all of whom are going through a personal malaise. It’s Anderson’s saddest film, a tragicomedy about squandered potential, misplaced nostalgia and staggering loneliness. But “Tenenbaums” is not a cautionary piece; No lessons are taught. Anderson is startlingly unsentimental. That’s not to say cynicism runs rampant, quite the contrary. There’s an emotional honesty and a refreshing lack of hipness and pretension that makes you care about people who are not at all cuddly. “Tenenbaums” is so meticulously art directed that some viewers felt overwhelmed to the point of distraction (even more than the scene in the jammed games closet, where that was the intent). But the recurring motifs (such as the use of the same simple Futura Bold font for everything from signage to book covers and the symmetrical placement of household items) give the film a unique formality that take it into that slight surreality that serves the characters so well. None of the details are affectations for their own sake. Unlike the monkey barrels of disparate flourishes that rarely coalesce in the films of, say, Joel Schumacher, everything works in sync in Anderson’s world. Adding to the emotional depth is Anderson’s smart use of music in his films. In addition to scores by Devo ’s Mark Mothersbaugh, the movies utilize songs that complete the scenes and the characters. The Faces’ “Ooh La La” with its “I wish that I knew what I know now when I was younger” chorus succinctly summarizes as the characters dance at the end of “Rushmore .” Elliott Smith’s “Needle in the Hay” rings with an even sadder irony now during a suicide attempt in “the Royal Tenenbaums ” and the slow motion shot of Gwyneth Paltrow walking from the bus to Luke Wilson as Nico’s “These Days” plays is an utterly perfect cinematic moment. Another trait Anderson’s movies share is the lack of a happy ending in favor of a bittersweet one. The characters have changed, they’re almost all in a different place than when we first meet them, but, like the end of “the Graduate ,” their fates are still uncertain. We hope they’ll be happy, we hope Max will go on to greatness, we hope Chas Tennenbaum will be able to move on from grieving for his dead wife. But we’re not sure. That’s one of the main things that make these movies resonate so powerfully. 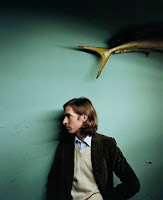 Wes Anderson (and his co-writer, Owen Wilson) makes those rare movies that take us someplace that’s not real, but to which we can relate, sometimes too much. Many of us wish we could be something more than what we are, and none of us know our future. But that’s life’s rich pageant, with its struggles, pain and uncertainty... if we accept its absurdities and follow our hearts, it can be a really rewarding piece of art.